The typical ‘Move Up’ scenario is one in which you are actively pursuing a new home purchase but, in order to move forward, you need help selling an existing home. While this situation is commonly referred to as a “move up program”, it does not always have to involve moving from a smaller to a larger or more expensive house. Sometimes, it simply involves finding a house that is a more appropriate size or in a more ideal location for your current circumstances. Our Move-Up Program gives you the option of choosing a program that is tailored to meet your goals and fit your specific needs. This program is designed to save you time and money during this process, and clients appreciate our outstanding track record of success. We believe that the business of selling homes is just that….a business, and you deserve to work with a company with the experience to manage that process professionally and successfully. 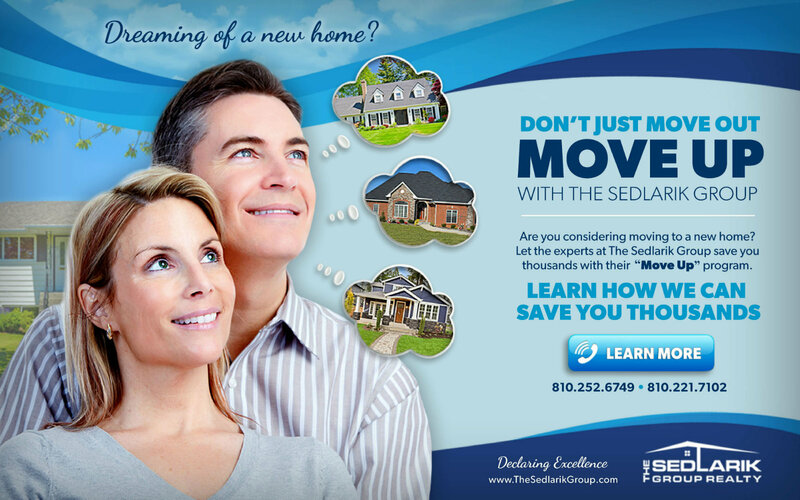 Professionalism and customer service are hallmarks of The Sedlarik Group, and it doesn’t hurt that we have figured out a way to provide our service while reducing the traditional expenses associated with the moving process. Everyone one who has participated in the Move Up program has said they would recommend it to their family and friends. We look forward to showing you how our system can accomplish your goal, while saving you thousands of dollars.